After delivering the discourse on the Dhammacakka, to the five Waggiya bhikkhus, the Buddha remained in Benares, at Isipatana, Deer park. (today's “Varanasi” in Sarnath – ancient suttas refer to this place as “Baranasi”). During this time there lived in Banares a young man called Yasa. He was a millionaire who lived in luxury. Hearing about the Buddha, and realizing the futility of worldly life, he stole away from home at night to see the Buddha. The Buddha invited him to sit down spoke to him. While listening, Yasa became a “Stream winner” – “Sothapanna”. Later he ordained and became fully enlightened as an Arahant. His father who came looking for Yasa also met the Buddha and hearing the Dhamma from Him became so inspired and took refuge in the Buddha, Dhamma and Sangha. He was the first “Upasaka”, the first lay disciple of the Buddha. 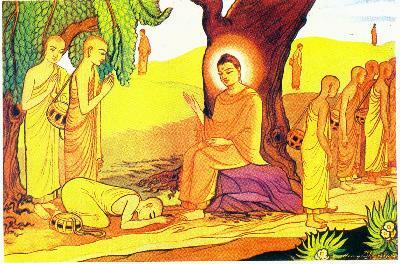 He then invited the Buddha and Venerable Yasa to his house for a meal (alms). When the Buddha, visited his house and explained the Dhamma, Venerable Yasa’s mother, and former wife also became inspired and sought refuge in the Buddha, Dhamma and Sangha, and became the first two Upāsikās. "Caratha bhikkave carikan, bahujana hitaya, bahujana sukhaya................. ......... ......."
With this exhortation the Buddha despatched His First sixty disciple Arhants in various directions. A layman who takes refuge in the Buddha, Dhamma and Sangha, (the Triple Gem)is called an Upāsaka . A laywoman who takes refuge in the Buddha, Dhamma and Sangha is called an Upāsikā.